Gen Gun Maw, the vice-chief of staff of the Kachin Independence Army, talks exclusively with The Irrawaddy at his command center in Laiza. Behind the general hangs a picture of Aung San Suu Kyi while a projector streams video from the talks in Ruili and a banner which reads “God is our Victory” hangs nearby. With negotiations between the Kachin Independence Organization (KIO) and Burmese government restarting in the Chinese bordertown of Ruili on Thursday, Sumlut Gun Maw explains the key factors for achieving a lasting peace. Question: What are the conditions you bring to the table at the talks between the KIO and the Burmese government in Ruili today? Answer: We have already suggested to them that we proceed in three stages: firstly the preliminary stage of talks, secondly a national political dialogue and thirdly the implementation of the political accord reached. The main intention is to get equal rights and self-determination as agreed upon in the Panglong Agreement signed in 1947.
in Ruili. Both parties have to show willingness for political dialogue. Both parties must agree to report news only according to the facts. Neither party should make slanderous accusations of the other. After these conditions are met, we are willing to enter into a political dialogue. As a first step we call for a grand national assembly, possibly in Panlong. This convention should lead to an agreement between the government and all ethnic communities in Burma. We want to work together in every aspect of the ensuing development process, be it in infrastructure etc., and ensure that villages are rebuilt and victims compensated. After these political negotiations we demand the implementation of the agreements reached. To sum up, in a first step we are talking now in Ruili, after these talks we want that all ethnic communities of Burma come together and reach a political accord, and thirdly we want this agreement to be implemented. Q: Why did the last round of preliminary talks in January fail? A: At a preliminary level, we can’t say whether talks are a failure or a success. It’s not like the media reported. We are demanding for political dialogue first, the government is only talking about a ceasefire. Since 1994, we have been in a situation of ceasefire waiting for political dialogue. political party since late 2008, but the government did not allow the registration of the party. Before the 2010 elections, they told us we should wait for the new government after the election to have a political dialogue. Then, they forced us to transform into the Border Guard Force in 2009. After the elections, they still did not accept a political dialogue. Based on these tensions, the conflict started in 2011.
agreement, but they don’t tell them of our efforts for political dialogue over the last 17 years. Nobody sees our efforts. Q: Your talks with the Burmese government are hosted by China, how do you evaluate your relations with the Chinese government? A: We have to have a relationship with China and a good one, because we share a border with them. They just want stability along the border. Apparently the Government of Theinsein has limited influence over the military. The hostility is high. The Military brasses have only retaliation in their mine. They just do not want to accept the actual situation, the more the push in, the more they suffered. How many young lives will be sacrificed to this unnecessary war. Without the intervention of the powerful third parties, there will have no peace. Kachins will never accept lesser than the Rights promised to them in Panglong. They will never accept to abolish KIA. They have been running Kachin for decades independently without any assistance from the central Government. Their independent status and sovereignty must be respected. God Bless KIA and the Kachin People!!! Long live KIA!!! 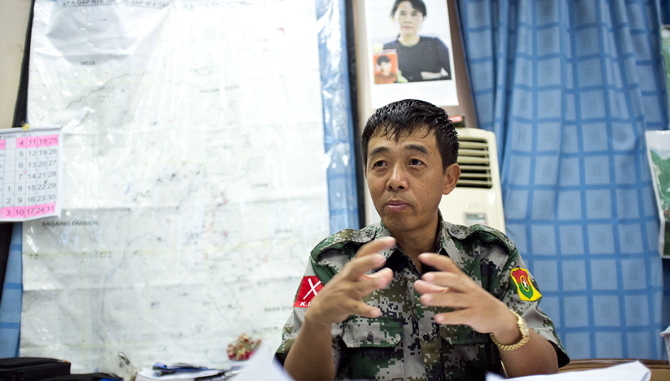 Congrats to Irrawaddy for this interview with Gen. S. Gun Maw. This should go along way to correct the effects of the general modus operandi of the west, especially the US, in pushing President Thein Sein for reform without at the same time telling the international community about the blueprint for reform the opposition has been offering since 1994. The effect is to cast the UNFC political position as faceless and voiceless in the west. The UNFC holds the key to peace and stability in the country. I hope this begins to correct the grievous error. Why would Burmese government want to build 7 huge dams including the Myitsone Dam without consulting people in Kachin State? Why would Naypyidaw decide such important issues in Kachin State without considering Kachin people’s view? These are totally unacceptable. That is why we need a federal democratic system with autonomous states, to have a say. I highly respect Gen Sumlut Gun Maw and KIO. I think they are pushing Burmese dictators to bring about a genuine change for everlasting peace. We don’t need ceasefire only; we need a real political solution and federal system which can guarantee people in Kachin State have a real say in politics.